I must admit I was taken aback by David Marsh’s blog post last week at Mind Your Language. In “‘The British Style’? ‘The American Way?’ They Are Not So Different,” he explains that British style for punctuating quotations is not as “logical” as popularly thought. Am I the only one who didn’t know that not all Brits even agree on this matter? That Radio Times style is not necessarily Guardian or Economist or Telegraph style? True, in all of them a period or comma may follow an end quote (not allowed in American style). But I’ve always thought (not proud of this) that the only determining factor was whether the punctuation was part of the original quotation. Yagoda thinks “logical punctuation” will prevail. Perhaps hoping to whip up some controversy, he e-mailed Chicago to ask whether The Chicago Manual of Style would consider adopting it for online prose. As you know, we’re pretty slow to jump in with endorsements or prohibitions when it comes to writing and editing fashions. We have the luxury of several years’ reflection between editions, and we don’t update our guidelines in the meantime. Our practice of having identical styling in print and online seems to work fine for us. Having just launched the 16th edition, we won’t be changing anything soon in CMOS. That said, we already recommend flexibility in styling for the sake of one’s readers. We publish books by Canadian and British authors, and in each case the manuscript editor decides whether to Americanize the punctuation and spelling or leave them as they are. If an online article or website is likely to be read internationally, that might be reason enough to adopt British-style punctuation. So it’s not like we would throw up our hands in horror. Naturally, we recommend consistency. Yagoda was what you might call “snowclowning” when he reported our reply as “in essence: ‘How about never? Is never good for you?’” But CMOS got feedback from all directions on it. I don’t know which was more annoying, the flak for our “rigidity” or the high-fiving from kneejerk sticklers. So this time let me speak for myself: Who wants a style you have to puzzle over or research every time you come to a quotation? Chicago’s styling and Yagoda’s “logical” method are both efficient in their simplicity. In or out: either way, everything will probably work out just fine. Last week, I asked how you would locate quotations within quotations in a Word document in order to style the inner quotes with single quotation marks. Your answers ranged from nonstarting to overthought to brilliant! Some of the answers worked fine for locating all of the hundreds of quotations, but since I wanted to locate only the twenty or so inner quotations, those solutions weren’t practicable. Macros for automatic replacements were likewise out of the question, since I was making corrections on paper proofs. Kathleen McLaughlin gave the most clear-headed answer, the one I actually used: go to the original, unedited file and search for the opening double quotation marks. (In the original file, which featured British-style punctuation, these appeared only for inner quotations. Outer quotations had single quotation marks.) Mark the corrections on the proofs. Simple, fast. Molly Hinshaw succeeded in solving the word-processing challenge (which did not indicate the availability of the original file) in a way that is both efficient and thorough. So he spoke to us then, all you warriors nodding from boredom. At the end of the highlighting, you can see the opening quotation mark for the inner quote. Kathleen and Molly, well done! And thank you to everyone who gave this thought and offered suggestions. In future, I would love to post more challenges. Feel free to suggest one on my Questions page. Part 1: Take the Challenge! Looking over the work of a proofreader the other day, I saw that she had marked a place where the quotation marks for a quotation within a quotation were incorrect. Single quotation marks were needed for the inner quote, but double quotation marks appeared. This was my fault; I had run a global search-and-replace to change British punctuation (single quotation marks) to American (double), and I had forgotten about the quotes within quotes. In the original version, outer quotations were in single quotes, and inner quotations were in double quotes. Now, thanks to me, all were double. The proofreader seemed to have done an excellent job, but what if she had missed some? Some of the outer quotations were pages long, and the inner ones could be lengthy as well—it would be easy to lose track of which was which. How the heck was I going to check this without reading the entire poem? Assume that this is your problem. You have the MS Word document you sent to the typesetter (a single file). How would you locate the inner quotations? I’ll tell you next week what I did. I’m not confident that it was the most efficient solution, but it took only a few minutes (not counting the hour I spent working on something else and thinking about it before I figured it out). Feel free to share your ideas below. I’m hoping we’ll all learn something. I am sometimes asked to mentor corporate communicators new to the field. I find this relatively easy and fun, until it comes to copyediting. I have been asked to edit pieces seriously off the mark: no point, no alignment with corporate objectives, rambling, no logic flow, redundant, no call to action. I am stumped on how to provide big-picture and detailed feedback that is both useful and motivating. I simply don’t know how to begin. . . . I’m paralyzed. I think part of my dilemma is that my own writing skills are instinctive. I have never been a writing instructor. Do you have advice for me? I want to be a caring, helpful mentor. You are obviously already caring, but you don’t yet feel competent criticizing the writing of colleagues. To organize your thoughts, create a list of writing issues like the ones you mentioned: vague objectives, lack of logic, rambling, repetition, and any others that you have identified so far. 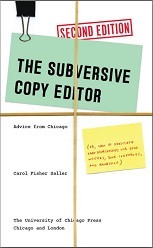 Give a copy to the writer up front and explain that these are areas that sometimes trouble corporate writers and that you’ll be looking at her work with those issues in mind. Do that, and keep notes. The checklist will help you organize your editing and your feedback. In your critique, if the writer has done well in some areas, you’ll be able to mention it. Any writer with initiative will begin to examine her own work for the kinds of trouble you point out. Second, to gain more confidence as a writing coach it might help to take a class in negotiation or writing or copyediting and make a point of observing the teacher. And take a look at Amy Einsohn’s The Copyeditor’s Handbook: A Guide for Book Publishing and Corporate Communications (especially the sections on editorial triage and querying). You’ll enjoy it and learn something useful. Where are all the good copy editors hiding? A colleague recently asked me where she could find someone to edit her dissertation, and I didn’t have a clue where to point her. Another acquaintance is hoping to expand her editorial staff, but has had trouble finding good candidates. Are there professional societies or clearinghouses or the like out there? Or perhaps someone to lead a safari to hunt down the rare and elusive style expert? Your wisdom on the matter would be appreciated! Professional freelancers get most of their business by word of mouth, so it makes sense to ask around. Your grad student colleague should ask new PhDs or faculty at her university for recommendations, and your hiring manager friend can ask current employees to spread the word that she’s looking—almost every good editor knows another good editor. Finally, the Editorial Freelancers Association website features a directory of freelance writers, editors, proofreaders, and indexers. Members write their own listings, so it is up to the hirer to check recommendations and judge whether qualifications and experience are apt. Readers: Write to me at my Questions and Suggestions page!